UNITED NATIONS, Sep 16 2013 (IPS) - After an intense investigation of the military attack on civilians in Syria last month, a U.N. team of arms inspectors has reached a predictable conclusion: the deadly attack had all the trappings of the widespread use of chemical weapons. But the team left an equally important question unanswered: who was responsible for that attack? 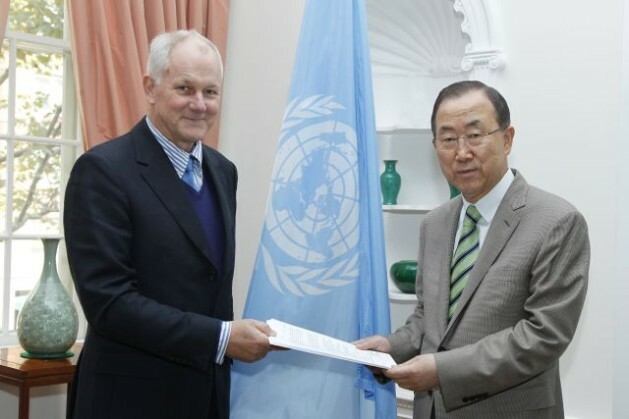 According to a mandate given by Secretary-General Ban Ki-moon, the U.N. team, led by Professor Ake Sellstrom of Sweden, did not have the authority to investigate culpability. The government of Syrian President Bashar al-Assad and the rebel groups blame each other for the attack. “The results are overwhelming and indisputable. The facts speak for themselves,” Ban told the Security Council Monday, immediately following the release of the team’s detailed report. Ban told delegates the team has concluded that “chemical weapons were used on a relatively large scale” in the Ghouta area of Damascus in the context of the ongoing conflict in Syria. Dr. Ian Anthony, director of the Arms Control and Non-Proliferation Programme at the Stockolm International Peace Research Institute (SIPRI), told IPS the next logical step would seem to be for the Security Council to evaluate the information as an urgent matter and come to a conclusion on the issue of who is responsible for the use of chemical weapons. “The Security Council, with all its members acting together, then needs to chart a path forward,” he added. The team interviewed more than 50 survivors, medical personnel and first responders. It applied a rigorous and objective selection process designed to identify survivors who may have been exposed to chemical agents, according to Ban. The team also assessed symptoms and collected biomedical samples, including from hair, urine and blood. Ban told delegates the team documented and sampled impact sites and munitions, and collected 30 soil and environmental samples far more than any previous such U.N. investigation. The statements by survivors offer a vivid account of the events on that fateful day, Aug. 21. He said survivors reported that immediately after the attack, they quickly experienced a range of symptoms, including shortness of breath, disorientation, eye irritation, blurred vision, nausea, vomiting and general weakness. Many eventually lost consciousness. First responders described seeing a large number of individuals lying on the ground, many of them dead or unconscious. The team also interviewed nine nurses and seven treating physicians, several of whom responded immediately to the incident. “They reported seeing a large number of people lying in the streets without external signs of injury, some with laboured breathing, most of them unconscious,” Ban told delegates. After the briefing, Ambassador Mark Lyall Grant of Britain told reporters “there is no doubt” chemical weapons were used by Syrian security forces, not rebels. “These were not cottage industry weapons,” he added, implicitly accusing the Syrian government of the attack. Reinforcing his argument, U.S. Ambassador Samantha Power told reporters the 122 mm rockets used to deliver the chemical arms were “not improvised weapons” but professionally manufactured. “There is no evidence that opposition forces are armed with sarin gas,” she added. But Ambassador Vitaly Chukrin of Russia, a country strongly supportive of Assad, decried the attempt to “jump to conclusions”. Poo-poohing the charges, he said if the Syrian government had in fact used chemical weapons, how is it that there wasn’t a single rebel casualty in the attack, which killed mostly civilian men, women and children. “The rockets missed all their targets,” he added, with a tinge of sarcasm. In a statement released Monday, Philippe Bolopion, U.N. director at Human Rights Watch (HRW), said the fact that no perpetrator was clearly fingered in the Sellstrom report should further compel the Security Council to refer Syria to the International Criminal Court (ICC), so those behind the vicious Ghouta chemical attacks, and the other major crimes in Syria, can be held to account. “Enforcing a red line on the future use of chemical weapons will take more than a deal on monitoring Syria’s stocks: it will require that those who pressed the chemical button face justice for their crime,” he added. SIPRI’s Anthony told IPS that based on the U.N. team’s findings, the Security Council needs to craft a response that on the one hand holds the identified perpetrators accountable, and on the other hand does not either escalate the present conflict, or derail the prospects for progress towards ending the conflict through a political settlement. The way forward must include implementing chemical weapons disarmament, he said. Meanwhile, the U.N. team is expected to return to Syria “as soon as practical” to complete its investigation of an earlier chemical weapons attack in Khan Al Assal. The team will issue its final report after that investigation.